We here at canadianinportugal.com like to help out the community whenever we can. We recently received an e-mail from the Toronto-based Portuguese Ball Hockey Association (PBHA) asking us if we'd be so kind as to help them out in their search for players. The reason they are searching as far away as Portugal is due to the fact that they are in need of players with Portuguese nationality. Although most of the players on the PBHA roster are of Portuguese descendents, most do not possess Portuguese citizenship and thus can not represent Portugal on the National Team and in international play. So if you think you've got what it takes (and we know there's some of you out there) to wear the Portuguese colours (check them out below), you can get in contact with Fernando de Menezes at fernando_demenezes@rogers.com. 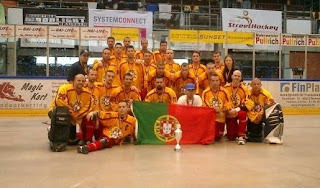 You can also visit the PBHA website at http://www.portugueseballhockey.com/, or check them out on facebook here http://www.facebook.com/The.PBHA.